Here in Central Florida, the parking lot design is the first and the last part of a building complex to be viewed by the visitor or resident of that building. 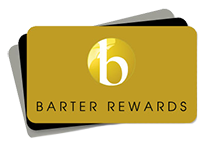 It is the gateway through which all customers, visitors, employees and residents pass. Especially with Central Florida’s year round good weather, this first impression is very important to the overall feeling and atmosphere conveyed to the user. In Florida, developers pay particular attention doing everything possible to make their new facilities attractive, well designed and functional. Though many hours are spent on producing aesthetically pleasing building designs here in Orlando Florida, the same design consideration for parking lot design is often overlooked. Pavements in parking areas that are initially under-designed for the Florida climate can experience excessive maintenance problems and a shortened service life. When properly designed and constructed in Central Florida, parking lot designs for parking areas can be an attractive part of any facility while at the same time being safe, and most important, usable to the maximum degree for the longest possible time. 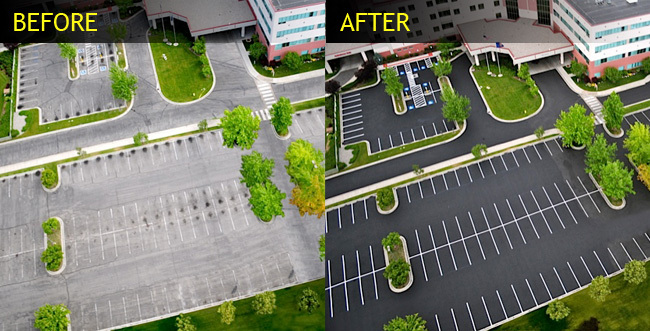 In addition, parking areas should be designed for low maintenance costs and easy modification in the Florida climate. Also attention should be paid to making future modifications, due to use patterns, be easy and cost effective. In developing the parking area plan here in Orlando Florida, several important details should be considered. First and foremost in the mind of the developer may be providing the maximum parking capacity in the available space while ensuring convenience and safety in our Central Florida sub-tropical environment. Use rectangular areas where possible. Make the long sides of the parking areas parallel. 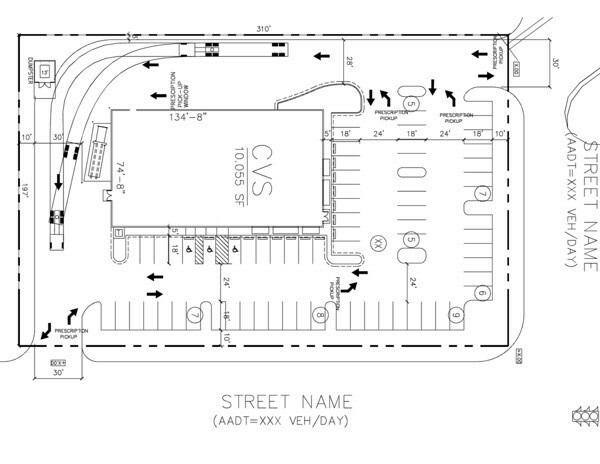 Design so that parking stalls are located along the lot’s perimeter. Use traffic lanes that serve two rows of stalls. Special attention should be given to the flow of traffic in and out of the lot as well as circulating routes inside the lot. During parking lot design in Central Florida, keep entrances far away from busy street intersections and from lines of vehicles stopped at a signal or stop sign. Be sure that the entering vehicles can move into the lot on an internal aisle, thereby avoiding entering congestion caused by involvement with turning vehicles. A pedestrian traffic-flow study is important to provide information about both safety and convenience. 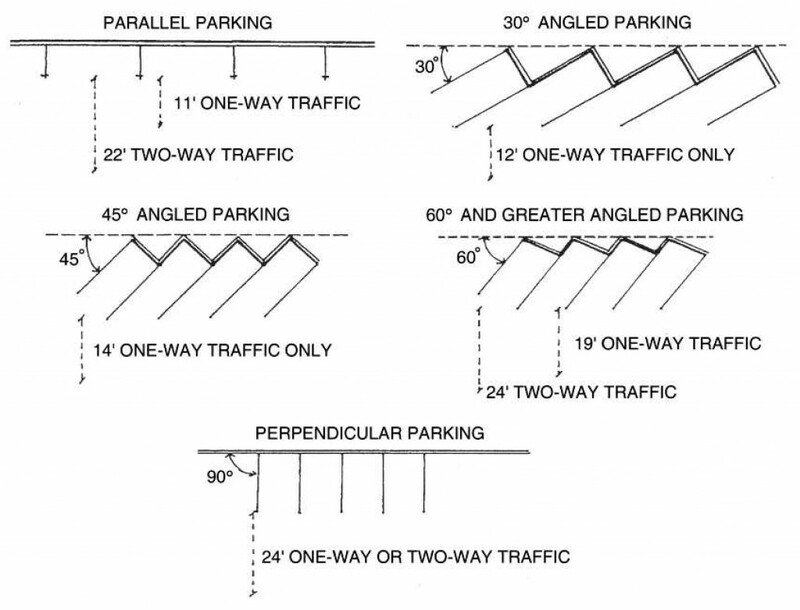 The most popular angles for parking stalls are 60’, 45’ and 90’. 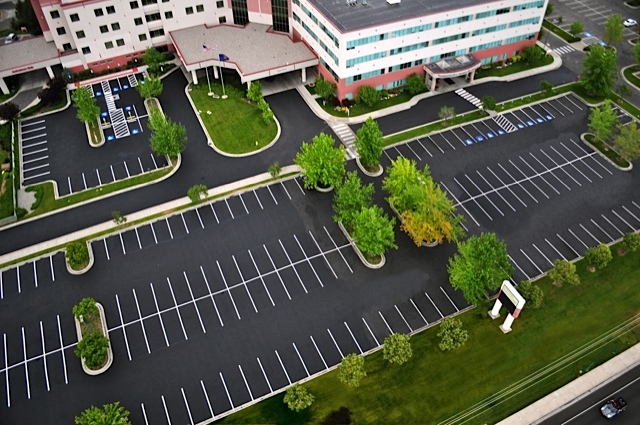 The most common angle for parking lot design is the 60’ angle because of the ease of operation it provides. This angle permits reasonable traffic lane widths and eases entry and exit of the parking stall. Where lot size restricts the dimensions available for aisles and stalls, a 45’ angle may be used. The smaller change of direction required to enter and back-out of the stall space permits use of narrower aisles. The 45’ angle reduces the total number of parking spaces for a given area but is the only acceptable angle for a herringbone parking lot pattern. The 90’ parking angle provides the most parking spaces for a given area. The high degree of difficulty for entering and leaving these parking stalls make this type of parking more suited to all-day parking, such as employee parking. This angle is generally not preferred for “in and out” lots such as those of fast food restaurants and banks. Typical parking stall dimensions vary with the angle at which the stall is arranged in relation to the aisle. Stall widths (measured perpendicular to the vehicle when parked) range from 8-1 to 9-1 feet. The minimum width for public use parking spaces is 9 feet by 19 feet. Perma Stripe of Central Florida recommends stall dimensions for compacts and similar-sized vehicles are 7-1/2 feet by 15 feet. If a number of such spaces are to be provided, they should be grouped together in a prime area to promote their use. 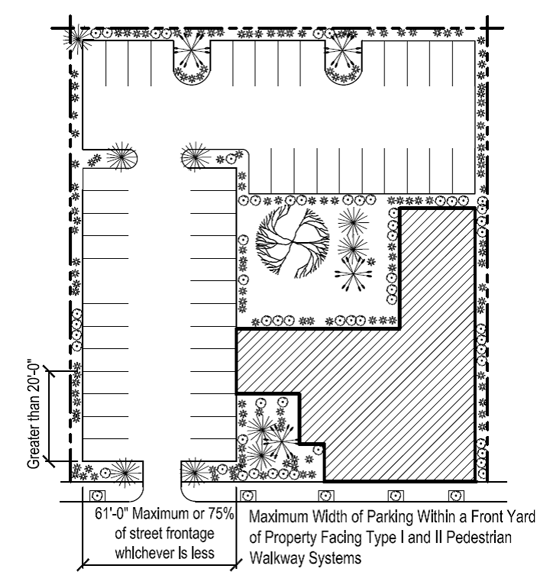 Stall widths for parking lot design in Orlando Florida where shoppers generally have large packages, such as supermarkets and other similar parking facilities, should be 9-1/2 feet or even 10 feet wide our of courtesy to the patrons of the store. Markings are a very important element of a good parking lot. The parking area should be clearly marked to designate parking spaces and to direct traffic flow. As specified in the “Manual on Uniform Traffic Control Devices” or (MUTCD), parking on public streets should be marked out by using white traffic paint, except for dangerous areas, which should be marked in yellow. However, yellow lines are commonly used in off-street parking lots. All pavement striping should be 4 inches in width.